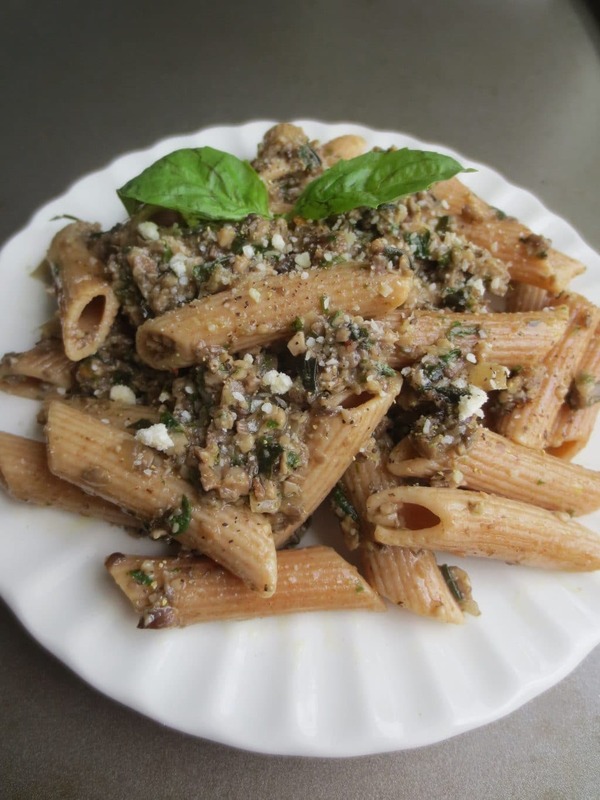 A “meaty” vegetarian mushroom basil pesto pasta dish. 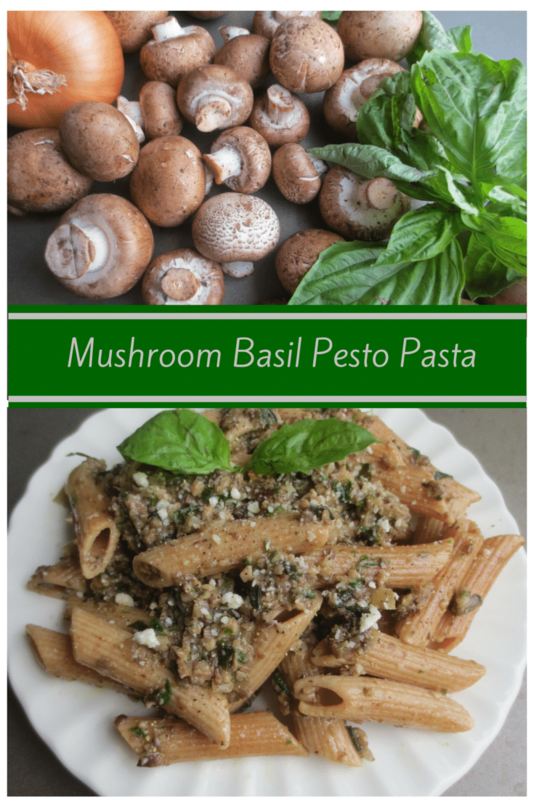 Mushrooms and basil are two of my favorite ingredients to cook with and eat! So, why not put them together to make this delicious, chunky sauce? Pesto is traditionally made with basil, parmesan and pine nuts. I think the addition of mushrooms give it great flavor and a meaty texture. You could also use the sauce as a filling for stuffed chicken, quesadillas, stuffed shells, a base for pizza or topping for crostini. Pesto is traditionally made with basil, parmesan and pine nuts. I think the addition of mushrooms give it great flavor and a meaty texture. You could also use the sauce as a filling for stuffed chicken, quesadillas, stuffed shells, a base for pizza or topping for crostini. Oh, the options are endless! Start by sauteing the onion and garlic together over medium heat, set aside. Don’t forget to start boiling your water for the pasta, add salt to season the water. Using the same pan, saute the mushrooms in batches, try not to crowd the pan. When the mushrooms are almost done (5-8 minutes), add the white wine and let it cook down and reduce for a few more minutes. Put the onions and garlic back in the pan with the mushrooms and combine. Add the spinach, let it wilt for a few minutes. Remove the pan from the heat. The water is probably boiling by now, add your pasta of choice. Get your food processor (or blender) out and add all of the mushrooms, onions, garlic, and spinach. Add parmesan cheese, milk, salt, and pepper. Thinly slice the basil and put that in the mix too. Add 1/4 cup of olive oil turn on the processor. Blend until it’s pretty small chunks. Add more olive oil if you like it a little saucier and less chunky. Drain the pasta and mix the sauce in. My fiance wanted chicken, so I added some chunks of rotisserie chicken to it for him. I ate mine without chicken (I added extra parmesan cheese and basil to mine) and it was so good! Saute the onions, garlic, and mushrooms in 1 tbsp of olive oil, until soft. Add the wine and let it cook down and reduce. Add the spinach and let it wilt. Boil the water, add salt and cook the noodles in a separate pot. Put the mushroom mix into a food processor. Add parmesan cheese, basil, salt, pepper, and 1/4 cup of olive oil. Pulse until you get a chunky sauce. Strain the pasta and add the mushroom sauce to the noodles and combine. « 20 Publix Products You Should Have in Your Stockpile!